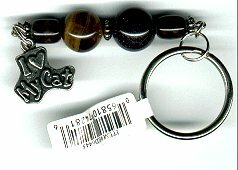 This distinctive cat key ring has four brown and black multicolored beads and a pewter charm that says I Love My Cat. A total of 5" in length including the ring. This is a cat lover's statement wherever it goes.